Hi. 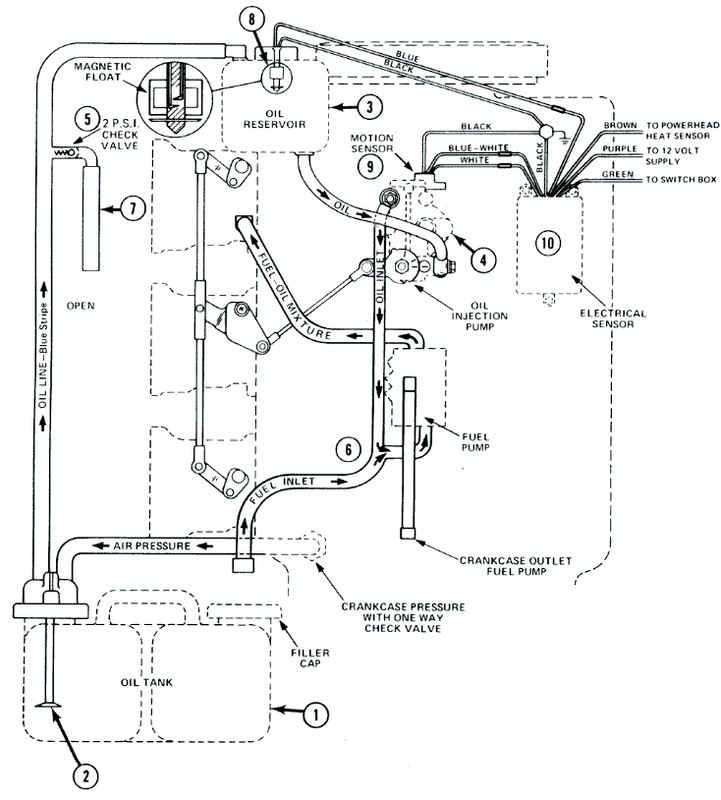 I am looking at potentially pulling off the oil injection system on a 1987 Mercury 150. I have a constant BEEP-BEEP-BEEP aural alert indicating an oil alarm. The engine is running fine,and the oil pump is pumping oil for sure; I can see the oil in clear tube from pump to oil gas mixing block. I checked the oil cap float level [switch], and it was okay as measured with ohm meter; the oil reservoir was full. I checked the voltage (on a white wire: a solid 11.5-Volts, although this seems low. I checked the oil pump sensor (white/blue wire to ground): 4.5-VDC, but as I rotated the engine more than two revolutions it never dropped to around 1-VDC and always remained at 4.5-VDC. Today I fired up the engine, convinced it has oil and it has blue oil indicative of oil burning. I pulled off the green/wire from the number-4 cylinder switch pack coil connection that goes to the oil alarm and the BEEP BEEP BEEP stopped. I was thinking that I might have found the [cause of the alarm] but with no coil wire going to the oil alarm module, it seems like the alarm doesnt work. I pulled the oil reservoir oil cap off and this didnt trigger an alarm. I would rather keep the oil injection but at this point I am not sure what to do. Does pulling the green wire from switch pack to oil module completely turn off the oil alarm module? Should the oil cap alarm still work then? Anybody with any feed back would be much appreciated. was hoping to keep the oil injection but will pull it off as last resort. The one thing I noticed in doing some of those tests is when measuring the white blue pump sensor voltage, I noticed 4.5vdc. I rotated the engine several revolutions (with spark plugs out) and never saw the voltage drop. This didnt match with what was the expected result of the voltage dropping to approx 1vdc every 2 revolutions. I also noticed that when I pull the green wire from the switch packs used to compare against the pump sensor voltage, the BEEP BEEP BEEP goes away. Do you know if pulling the green wire from the switchpack to the oil module, disables the oil module? I do know that the engine is getting oiled and oil is coming out of the oil pump. Hi. I have a measurement on the oil pump sensor that says measure the blue white wire to ground and you should have 5-Volts DC +/- 1-Volt. Also every two rotations of the engine, this voltage should drop to less than 1-Volt DC. In my instance, I have 4.75-Volts DC, constant. There is NO DROP every two revolutions. The white wire to sensor has 11.7-Volts DC. Is this indicative of a oil pump sensor problem? That you don't get a signal from a sensor does not mean the sensor has failed. The sensor only produces a signal when the mechanism that is triggering the sensor is present. --the condition that the sensor monitors HAS occurred, but the sensor has failed to detect it. For example, a sensor that is supposed to signal when the temperature of its input sensing area exceeds a certain temperature does not signal when that temperature is exceeded, and you have confirmed that the input condition does exist. In the case of a sensor that is supposed to detect rotation of the crankshaft, if the crankshaft is rotated and no sensor signal occurs, then you might suspect the sensor has failed. But you should investigate the exact mechanism by which the sensor detects the rotation. There could be some sort of mechanical linkage that has failed, and while the engine is being rotated, the sensor has no input of that rotation due to a failure of the linkage. The crankshaft may be rotating, but if the sensor is not positioned in some way to directly sense that rotation and depends on some sort of linkage--such as a geared drive--the problem could be in the linkage. In the case of this Mercury outboard, I believe the motion sensor is location at the oil mixing pump and detects motion of the input shaft of the pump. It does not actually monitor the crankshaft. 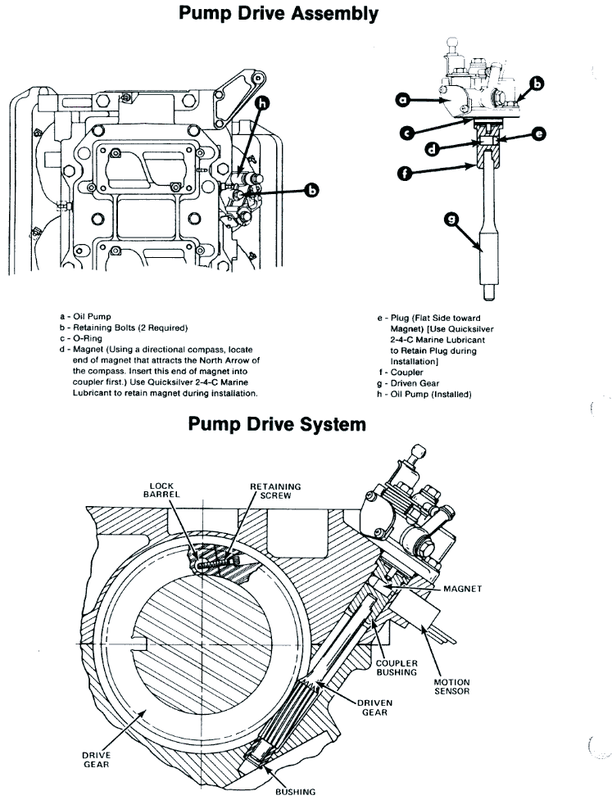 The input shaft of the pump is driven from a plastic gear on the engine crankshaft. You have tested the sensor output while rotating the crankcase. But did you observe the input shaft of the oil pump to verify that it was actually rotating with the rotation of the crankcase? If the plastic gear on the crankshaft has failed, the mixing pump won't be rotating, and the sensor won't have any input. The sensor won't produce the proper signal. But that is not because the sensor has failed. The real problem may be the linkage to the crankshaft has failed--and that is a very common problem with that engine--plastic gear has failed. Think MECHANICAL instead of ELECTRICAL. To test just the sensor, remove the oil mixing pump and manually rotate its input shaft. Now test for proper sensor output. If you get the proper signal from the sensor, this should verify the sensor works. The real problem is then likely to be that the coupling to the crankshaft has failed. Note that locating the sensor at the input shaft is a VERY GOOD design. The sensor monitors for a failure of the pump shaft to be turning. It does not monitor for a failure of the crankshaft to be turning, as that is a rather obvious condition--the engine has stopped. So your test method was flawed. You assumed that the coupling between the crankshaft and the pump input was working, and when you got no signal from the sensor, you assumed the sensor failed. Thanks Jim, The only other thing I can add is that oil is being pumped out of the oil pump. I have a clear tube where I can see the oil slowly dripping down toward the oil gas mixing block. Without pulling the oil pump I am assuming that it is working. Do you think that is a good assumption or should I pull the oil pump? Because there are several sensors inputs that can cause the alarm module to produce the BEEP-BEEP-BEEP cadence for the aural alert sounder, you should verify which one of the inputs is actually causing the alarm. This can be a bit tricky, as you must know what electrical condition on each of the alarm module inputs is considered to be an alarm condition. You will have to deduce what the electrical status for each input is supposed to be for the alarm condition and the no-alarm condition. Let's see if we can do that. The callout in the drawing labeled "10" identifies the "electrical sensor." This device is also identified in the text of the manual as the "warning horn." Perhaps a better name is ALARM MODULE, as it is certainly more than a horn and not quite just a sensor. The BLACK and VIOLET are clearly the power connections that supply power to the "electrical sensor" or what I would call the alarm module. BLUE = connected to a float switch; this input senses the oil level in the under-cowling reservoir tank; the action of the switch is not described, that is, we don't know if the float switch is closed to indicate an alarm or if the float switch opens to indicate an alarm; the switch action could be determined by disconnecting the blue conductor and measuring the switch circuit continuity. GREEN = connected to "switch box." In Mercury engine nomenclature the "switch box" is the electrical or electronic module that develops the current for the primary winding of the spark coils. My inference is that this GREEN circuit carries some sort of pulsed voltage to the "electrical sensor" that is proportional to the engine rotation speed. A further inference is that this signal is used in some sort of comparator circuit to establish if the rotational speed of the mixing pump shaft is appropriate for the crankshaft speed. WHITE = connected to "motion sensor." It is difficult to know the electrical state of this signal. A reasonable inference is this signal is another pulsing DC voltage that has a pulse rate that is proportional to the rotation of the input shaft of the mixing pump. BLUE-WHITE = also connected to "motion sensor." Again, the electrical state of this signal is not described. A reasonable inference is this is a corresponding part of the WHITE wire's signal. BROWN = connected to powerhead heat sensor. Typically this is just thermal switch. The switch action can be determined by measuring the continuity on this circuit to ground. The most rudimentary approach to testing for which input is producing alarm signal will be to disconnect, one by one, each of the several wires from the several sensors, and see if the alarm stops. If this test produces the outcome of stopping the alarm, then you will have identified which wire and thus which sensor was signalling an alarm. The motion sensor relies on a magnet embedded in the oil mixing pump assembly to create the electrical signal. It is also not particularly clear from the drawing if the motion sensor can be separated from the mixing pump and replaced separately. lancelyons wrote: ...oil is being pumped out of the oil pump. I have a clear tube where I can see the oil slowly dripping down toward the oil gas mixing block. Without pulling the oil pump I am assuming that it is working. I cannot offer any advice on that. I don't know how difficult removal of the pump would be. If you are confident the pump is actually working, but the signal from its motion sensor is not, I don't know the best way to proceed. Please understand--I am not a Mercury outboard engine repair technician. I just try to explain the rudiments of this system. Problems with the Mercury oil mixing pump and the alarm module are very common. I don't have any statistical data on which element in the system fails the most. There are reports that the ALARM MODULE has failed, the DRIVE GEAR has failed, the FLOAT SWITCH has failed, and so on. I can't offer any insight on what might have happened in your engine, other than, based on your description, there does not seem to be a proper signal from the motion sensor. One word of caution, if you remove the probe for the oil pump and take the magnet out, remember there is a north and south pole for the magnet. Make sure you put it back in the way it came out. If you can wiggle the connections and get results, you probably have a loose or bad connection. I've found when I start the engine and grab the motion sensor and wiggle it around I can get the beeping to stop. This seems to suggest that the motion sensor might be a removable part. Again, I can't say for sure. At least manipulation of the electrical connections at the motion sensor seem to affect results. Regarding gss036's comments about the magnet, yes, the magnet has to go in one way and not the other. The end of the magnet that attracts the North arrow of a simple compass is the end that is inserted FIRST. If you have not messed with the magnet and then you put everything back together right and still get the alarm. I would only assume that the pick up sensor is bad for some reason. These things work on the same principle as old speedo controls, counting revolutions. This older thread contains a great deal of other very useful information. I recommend you very carefully read it for content. In any case, don't feel like you are alone. Some of the biggest stalwarts of Mercury outboards reveal in that older thread that they have suffered with these same alarm and oil pump failures on their older Mercury two-stroke-power-cycle engines, albeit when they were much newer than yours is now in 2018. Again, understand that as the publisher, moderator, and provider of this website, I have not performed every possible repair described in the hundred of thousands of articles that I maintain on-line in a well-organized, highly searched and indexed collection of useful boating information. I am more like a librarian in this case--albeit a librarian with 55-years of experience in solving electro-mechanical problems--and I try to point you to useful information. Also note that your 1987 engine is now 31-years-old, and if you go to a Mercury dealer there is a good chance that any mechanic there who is not about 60-years old will have never seen one of these engines before and probably knows nothing about fixing this problem; you will likely know more about it than they do. Also consider that Mercury has made an enormous number of completely different lines of outboard engines in the past 31-years, including engines made in China, Japan, and with parts--particularly electrical parts--made in Mexico, and the engine lines are all totally different: carburetors, simple fuel injection, OptiMax, re-badged Yamaha four-stroke, new China made four-stroke, VERADO, the "new" FOURSTROKE, and on and on. That you can walk into a Mercury dealer and they will be experts of this 31-year-old design, well, that is not likely to happen unless you find the dealer with that old guy in the shop with a good memory.